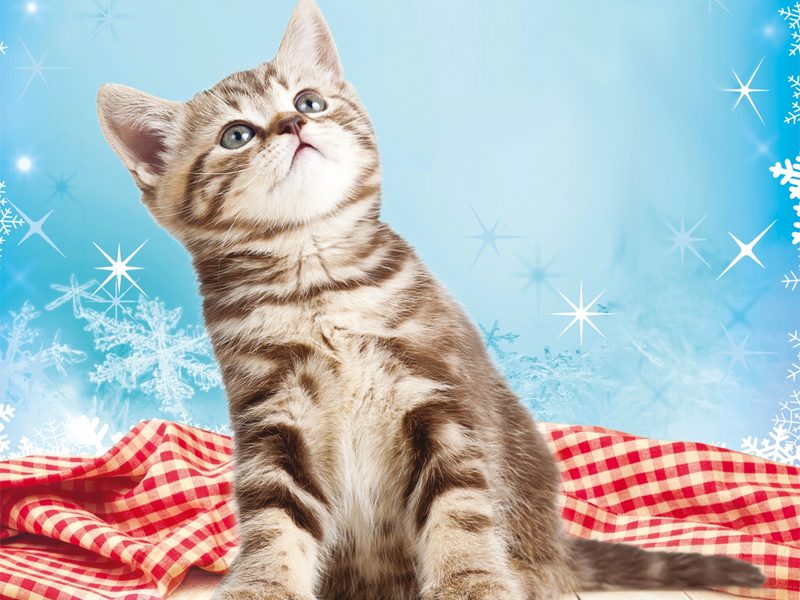 Molly, the feline star of Molly and the Cat Café, returns in this Christmassy short story from author Melissa Daley. I crouch behind the sofa, my whiskers trembling and tail twitching with anticipation. Outside the window, the pale winter daylight is quickly fading to a dusky gloom. My ears swivel as I hear the living room door creak open, followed by heavy footsteps and the sound of scraping across the carpet. Feline intuition alerts me to the presence of an impostor, mere inches away from me on the other side of the sofa. There is a rustling noise as the impostor rears upright. I peer around the side of the sofa and watch as my owner struggles to overpower her assailant. My fur prickles with the rush of adrenaline. I want to rush to her aid, but my head urges caution. Defeated, my owner leaves the room and I take a moment to observe our enemy. It stands proudly in the corner of the living room, brazen in its triumph. My eyes narrow as I assess the challenge, calculating how to inflict maximum damage on a foe many times larger than myself. My owner re-enters the room and I retreat into my lair once more, listening as she places a cardboard box onto the floor and begins to empty its contents. The impostor remains silent and motionless in a charade of innocence. My owner seems oblivious to the threat she faces, but I am not fooled. She empties the box painstakingly slowly, turning the contents over in her hand as she places them on the carpet. She must be choosing her weapons, but her nonchalance infuriates me. Her choice is a poor one: delicate glass baubles, glittery snowflakes, long strings of silvery tinsel. Panic rises in my chest. How will she defeat the impostor with these?,I wonder. I am ready and waiting, poised to leap to my owner’s defence. At last, battle commences. My owner moves first, stealthily piercing the impostor all over with her array of weapon-ornaments, before binding its body with tinsel. The occasional twitch of its green limbs is the only sign of resistance against my owner’s deft assaults. My owner inflicts the final humiliation, a wire star attached to the impostor’s head, before stepping back to admire her work. She smiles, naively believing she has triumphed, but I know better. My heart races, the denouement of this battle is fast approaching, and the time for my intervention is imminent. Momentarily my owner turns her back, bending over to reach for the power socket. A click, a crackle of static, and suddenly the impostor surges into life, sinister eyes of red and green flashing all over its body as it prepares for its counter-attack. My moment has come. I dart stealthily out of my lair and with a surge of energy through my muscles, launch myself off the floor. My legs are outstretched, claws bared; every inch of my body thrills with fear and excitement. I make contact with the impostor, and am instantly assaulted by its piercing green needles. My foe swiftly envelops me in its prickly embrace, but I am undaunted. My legs flail, and I feel them snagging on strings of tinsel and wire. I hear thuds and tinkles as ornaments drop to the floor where they smash at the impostor’s feet. It is angry now, retaliating violently under the force of my attack. The room becomes a blur, I can hear nothing except my blood thudding in my ears. I bite, kick, scratch, everything in my power to subdue my opponent. At last, the impostor sags beneath me, unable to withstand the force of my blows any longer. There is a dropping sensation as its sways, and I have a split second to leap to safety before it topples over. A moment’s silence is followed by a crash as my vanquished enemy hits the floor. Glass baubles crunch, shattered under its dead weight. It is over. I have won. “Molly!” It is my owner’s voice. She sounds alarmed, no doubt scared for my safety. I stare in uncomprehending disbelief as she rushes over to the impostor and carefully pushes it upright, desperately trying to straighten its snapped, misshapen limbs. “My beautiful Christmas tree! It’s ruined!” she whimpers, dropping to her knees to salvage what remains of the tangled mess of tinsel and broken glass on the floor. I saved you! I want to shout at my owner. A little gratitude wouldn’t go amiss! But she ignores me, her face contorted by an angry frown as she tends to the wounded enemy. Confused and humiliated, I dash behind the sofa and begin to wash. My owner lifts the impostor upright and I can feel it taunting me, its silent triumph permeating the room. My eyes narrow as I plan my retaliation. Next time, I will make sure the impostor is beyond saving. Next time, victory will be mine.